Kieran Maguire is a football finance expert in the University of Liverpool’s Management School. Both of Merseyside’s Premier League clubs have now published their annual accounts, and there’s plenty of good news to report from Anfield and Goodison Park. 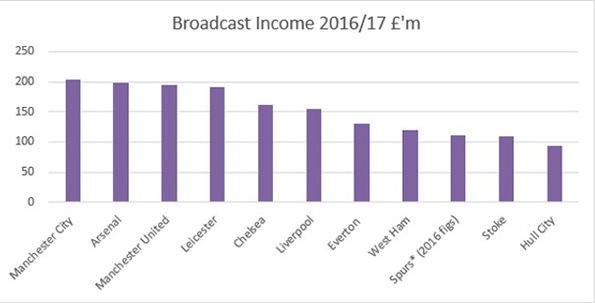 Clubs generate money from three sources, matchday, broadcasting and commercial. Not all clubs have reported their figures for last season. Liverpool’s investment in expanding the main stand at Anfield paid off with matchday income increasing 18% to over £73 million. Whilst they are still trailing rivals Manchester United and Arsenal, the gap has decreased, and they are now above other members of the ‘Big Six’ clubs, which gives Jurgen Klopp the resources to compete in the transfer market. Everton, under new owner Farhad Moshiri, took a different approach and cut ticket prices for both adults and children. This resulted in a £4 million decrease in matchday income, but many delighted Evertonians. Both clubs benefitted from the new £5 billion BT/Sky domestic broadcasting deal that commenced in 2016/17. Liverpool’s increase was lower due to the club not competing in European competition last season, whereas they earned €37 million the previous season in reaching the Europa Cup final. The importance of qualifying for Europe is shown from the above figures. It is worth £40-90 million to clubs depending upon how far they proceed in the tournament, so Liverpool will show a big increase in 2017/18 through their continuing involvement in the Champions League. 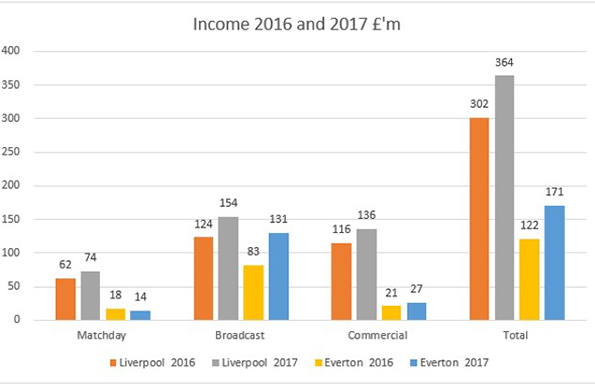 Everton, by finishing 7th last season compared to 11th in 2015/16, earned an extra £8 million in prize money as well as the new TV deal money. If clubs want to grow their income and compete with other clubs then establishing relations with commercial partners is crucial. 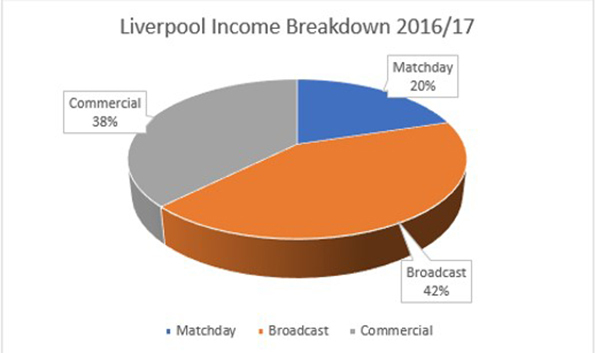 Liverpool’s income grew by £20 million, reflecting their incoming kit deal with New Balance, as well as the main stand extension generating more corporate box and catering income. 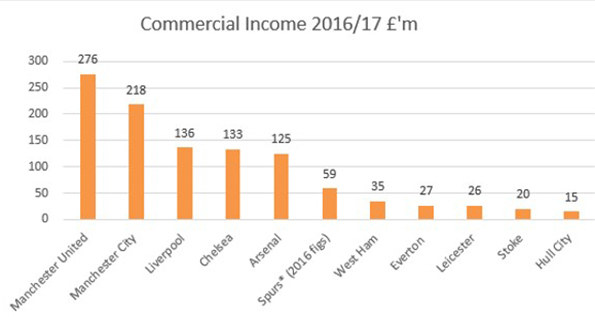 Whilst Liverpool are some way behind the two Manchester clubs, it is imperative that they generate competitive levels of commercial income compared to the rest of their peer group. 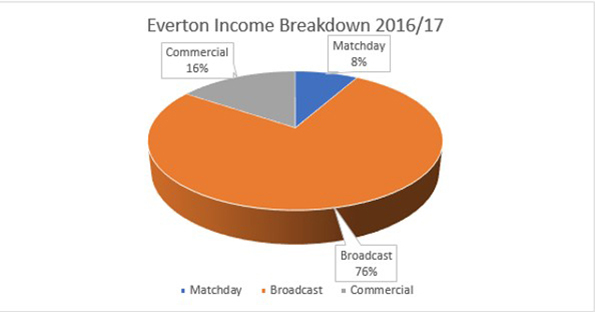 Everton’s commercial income rose by £6 million, mainly due to their training ground being sponsored by USM Holdings, a company owned by Alisher Usmanov’s Russian metal trading company. Usmanov bought Farhad Moshiri’s Arsenal shares from him, and the proceeds of which were then used to buy Everton. 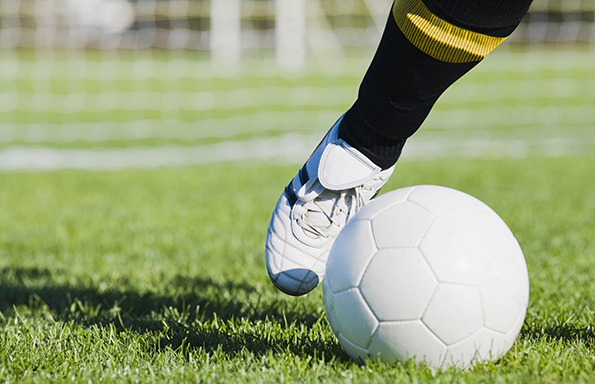 The main costs for a football club relate to players, in the form of wages and player transfer fee amortisation. Liverpool’s wage bill grew by £50 million in 2016 as Jurgen Klopp’s changes took place in terms of the playing squad. They managed to keep a lid on wages in 2016/17 due to the departure of some big money earners such as Mario Balotelli. 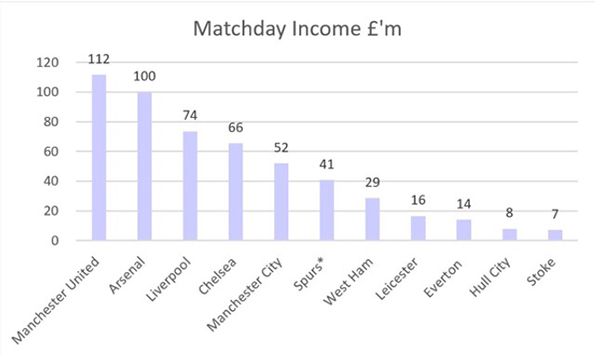 Liverpool only spent £57 on wages for every £100 of income last season compared to £69 in 2015/16. 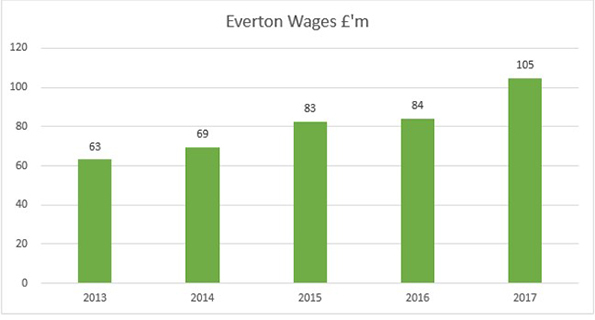 Everton’s wage bill rose significantly in 2016/17, reflecting Farhad Moshiri’s investment in the club and his backing for the manager in the transfer market. Whilst the wage bill increased the club only spent £61 on wages for every £100 of income compared to £69 the previous season. This is due to the extra TV and commercial income arising in 2016/17. Transfer fee amortisation is how a club deals with a player when he is signed from another club. So if a clubs signs a player for £40 million on a five-year contract, there is an amortisation cost of £8 million (£40m/5) a year. 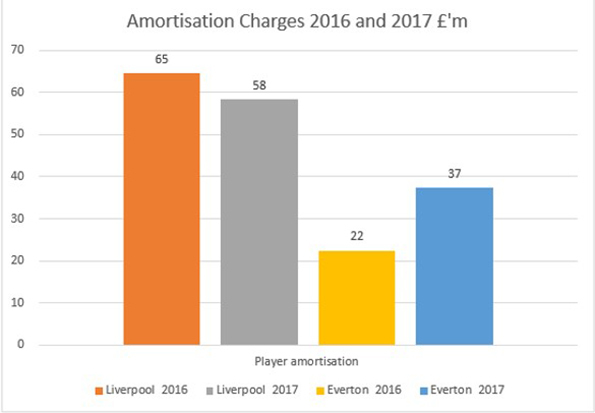 Liverpool’s amortisation cost fell, as the club took a more cautious approach in the transfer market, whereas that of Everton increased by 66% as Moshiri’s backing was reflected in buying players. Profit is income less costs. Here both clubs have shown a major improvement in 2017. 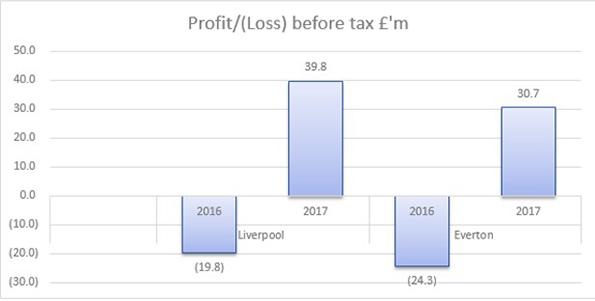 Pre-tax profits were much higher, in Liverpool’s case through not spending the extra £62 million of income on player wages, and in Everton’s from selling John Stones to Manchester City and making a £51 million profit overall on player sales. These profits can be reinvested in the playing squad for future seasons. Fans come to watch their heroes each week, and these heroes cost a lot of money in today’s transfer market. Liverpool spent a lot of money in 2016/17, mainly on Mane and Wijnaldum, but also sold Benteke, Ibe and Allen, so the net cost was only £4 million. 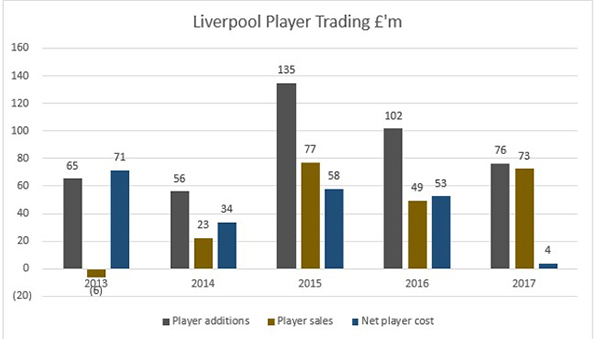 The accounts reveal that the club has however spent a net £146 million in the summer 2017 transfer market, which is before buying VVD and selling Coutinho in the January 2018 window. 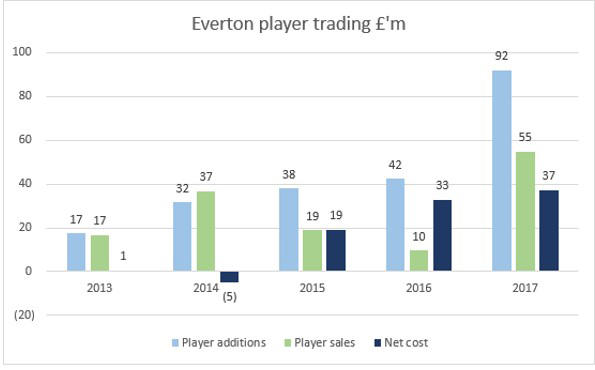 Everton, under new ownership, had a net spend greater than their city rivals for the first time in many years, as players such as Bolasie, Schneiderlin, Williams and Lookman came to Goodison on significant fees. The sale of John Stones was the major departure from a financial standpoint. 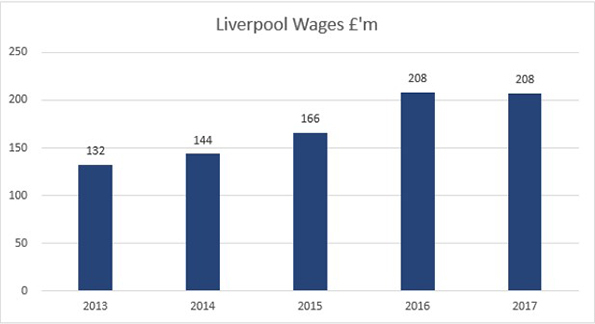 Using a model devised by former University of Liverpool Football MBA graduate Dr Tom Markham, Liverpool’s value nearly doubled in 2017 to £1,130 million. This is on the back of good cost control by the club and increasing all types of revenue by double digit percentages. We would expect this value to increase further in 2018 due to involvement in the Champions League. Everton’s value has increased too to £440 million. Given that the club was sold for an effective £175 million only a couple of years ago it shows what can be done on the back of improved income and not spending all of this on wages. Both clubs had an excellent year financially in 2016/17, the competition is tough, but there is scope for things to get even better in the future too.